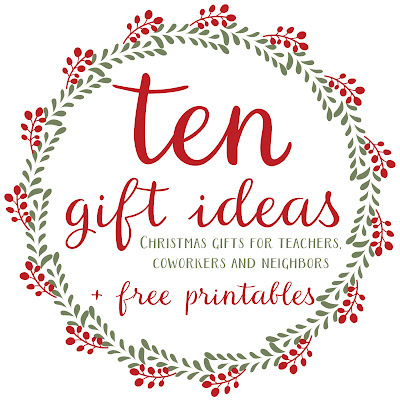 Ten gift ideas that start at less than a dollar per person? Now that's what I'm talking about! I love giving gifts but let's face it, you can't give everything to everyone all the time! 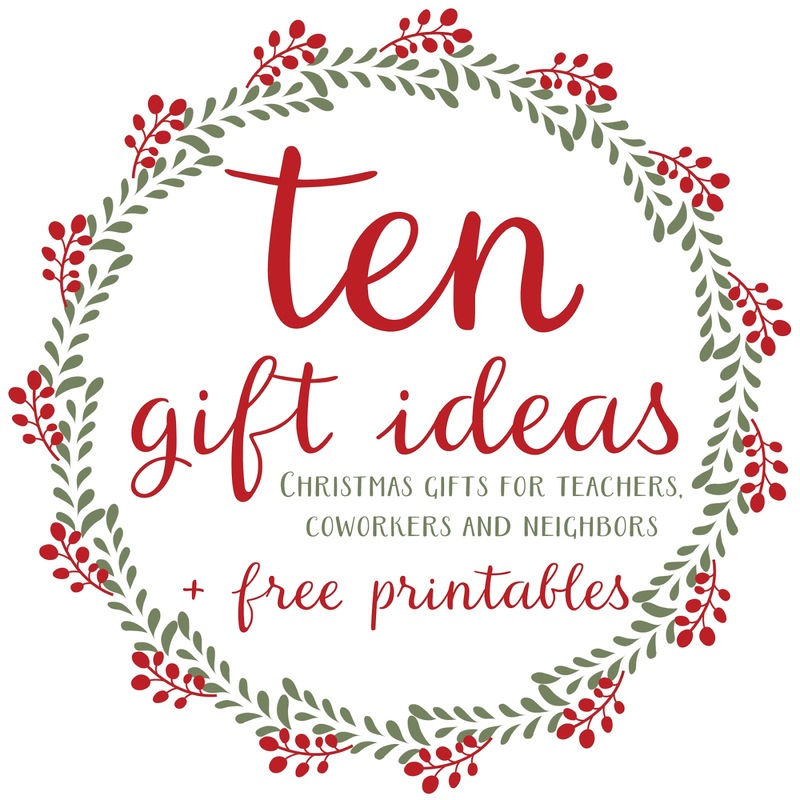 These are simple gifts that can be given to your child's teachers, coworkers or neighbors. I've even included the tags for you to download and print. 1. 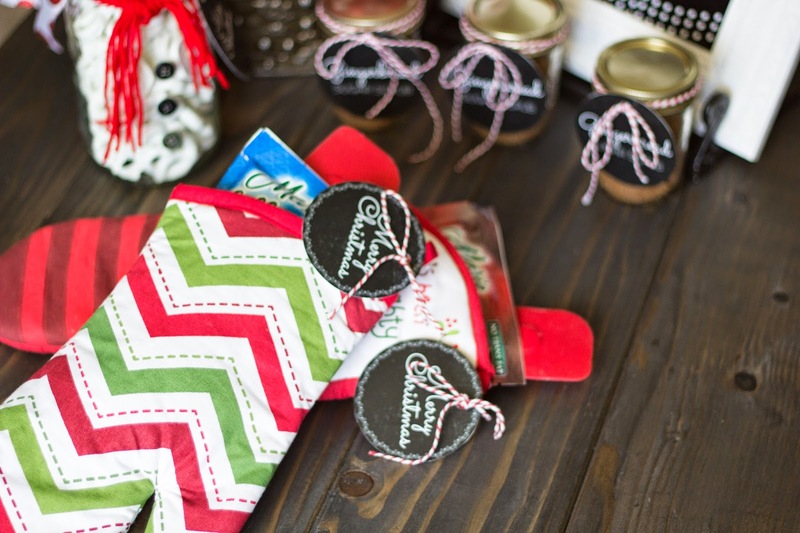 Baking Set: Who doesn't love fun and festive pot holders and aprons at Christmastime? Buy a potholder or apron and fill with baking mix and a spatula and spoon. 2. Hot Cocoa: You can't really go wrong with hot cocoa. 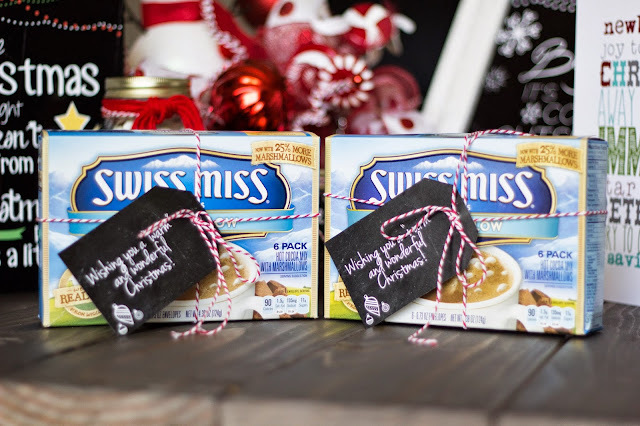 If you don't like the idea of giving the box, put it in a jar or put one pack in a cute Christmas mug. 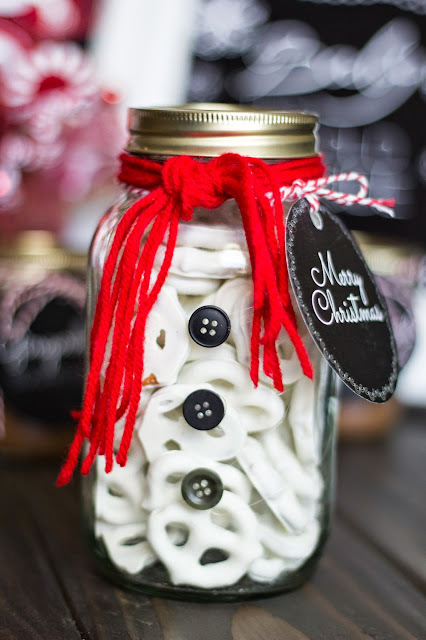 Tie with bakers twine and tag! 3. 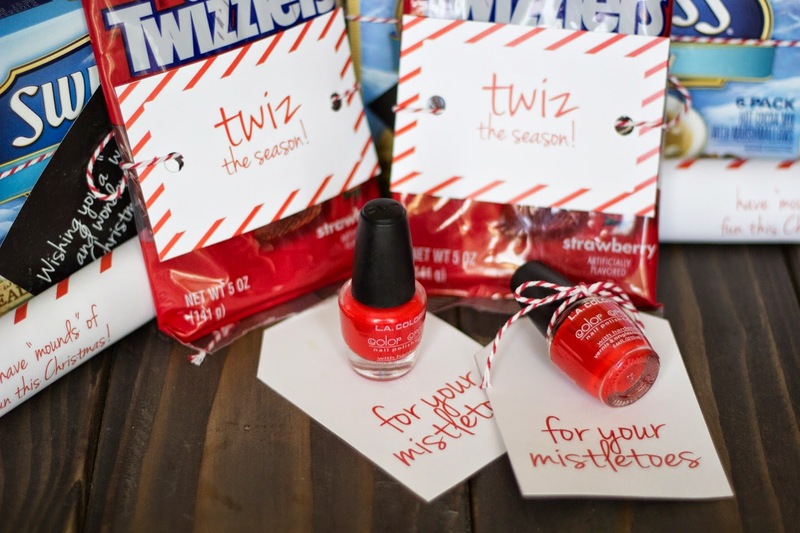 Twizzlers: Yes, twiz the season! 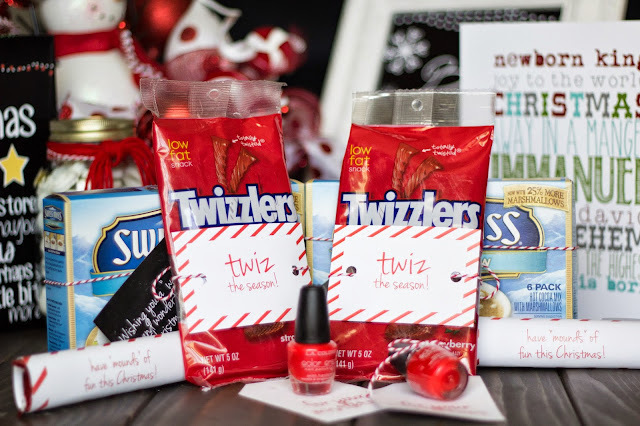 I haven't met a person who doesn't love Twizzlers! 4. Fingernail polish. Throw together a few combinations of colors or combine with Jamberries. Just glue the bottles to the tag! Polish is always a winner. 5. Printables. 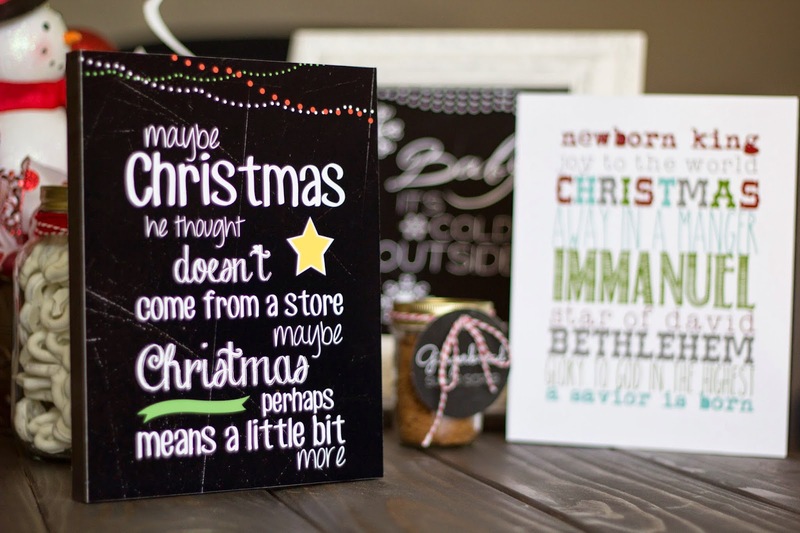 The internet is flooooooded with free printables! Download them as jpegs and send them off to Wal-Mart to be mounted or printed and pick out a cute frame. 6. Pretzel Snowman. Yes! This is even cuter in person. I couldn't get over it! My jar is still sitting in my pantry waiting to be filled again this year! 7 . Gingerbread Sugar Scrub. There are several recipes to choose from on Pinterest. Pick one that you like and make it! This smells heavenly. You just may be tempted to eat it. I won't judge. 8. Stovetop Scents. One of my all time favorites! These are SO SO SO cute. I couldn't get over how well these turned out. 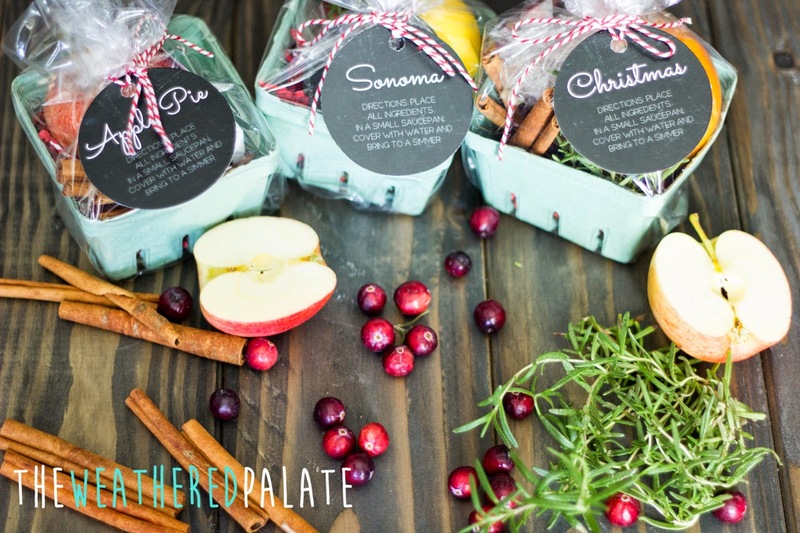 Package in a mason jar or these cute produce cartons from Hobby Lobby. Check out my blog post about these cuties (with printables)--> HERE. 9. 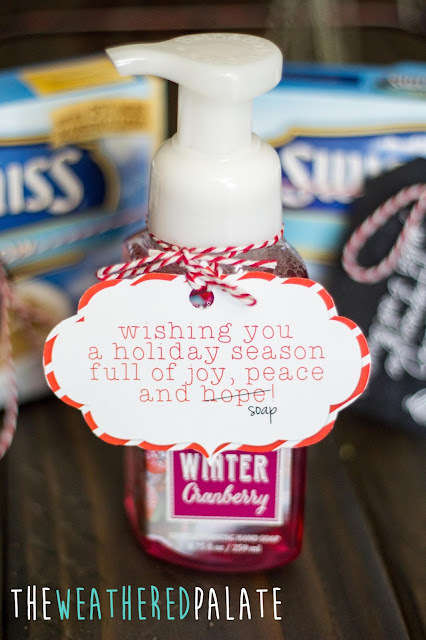 Holiday Soap. Bath and Body Works for the win! 10. I don't have a picture for this one, but I still have the printable! Wrap a Mounds bar with a wrapper that says have "Mounds" of fun this Christmas! You can use other candy bar ideas like 100 Grand-"Hope your Christmas is better than 100 Grand" the cheesier and punnier, the better. This would be a great gift for kids to give to their friends! Super easy, super inexpensive! I hope you have fun celebrating this year. 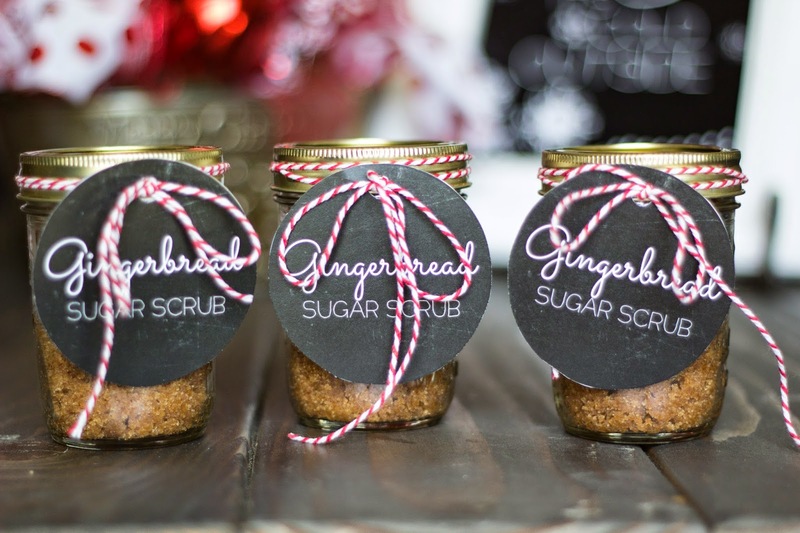 Thanks for sharing such a nice blog about Christmas gifts. 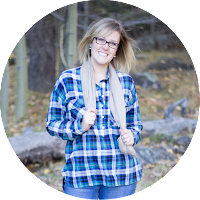 This post contains a great stuff about the Christmas day gifts. I really appreciate you for writing such an informational post. The hot figure of Delhi Escorts not to be taken daintily and bloomed yearning for, desi escorts is dream of each man’s bloomy dreams.